As I was driving along Interstate 89 on Friday night I noticed that the roadsides were lined with Wild Parsnip and earlier that week a friend of mine asked me if I had heard about plant. I have known about this weed for several years, but our conversation made me realize that many people haven’t. If you don’t know about this plant then you are probably wondering what it is and why you should care. Wild Parsnip or Pastinaca sativa, is an extremely invasive herbaceous perennial plant which originated in Europe and Asia. This plant invades disturbed areas and spreads rapidly. It can stand more than 4’ tall and has flat light green flowers which resemble that of Queen Anne’s Lace. 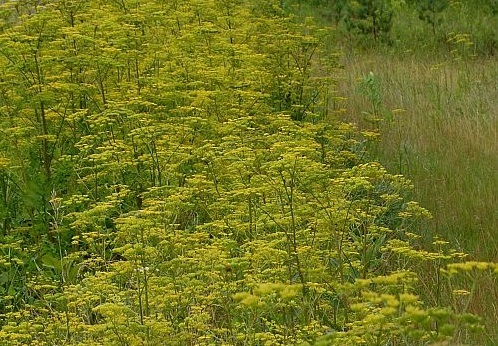 Why should you pay any attention to Wild Parsnip? Other than the fact that Wild Parsnip is an invasive plant, there is another major issue with having it in your yard. This plant has an extremely toxic sap. This sap reacts with the sunlight and can cause photo-chemical burns when it comes in contact with your skin. If your skin does make contact with the sap while working or playing in the yard, wash thoroughly, and keep affected area covered or out of the sunlight. If an extreme skin irritation such as blisters develops, you should call your doctor. The Vermont Department of Health or DR’s Country Life Blog.